His Highness the Aga Khan speaks at the annual meeting of the International Baccalaureate. Atlanta, Georgia, USA, 18 April 2008 - His Highness the Aga Khan, Imam (Spiritual leader) of the Ismaili Muslims, today said in addition to traditional subjects, schools across the world must teach pluralism - a capacity to see those from different backgrounds as equals. 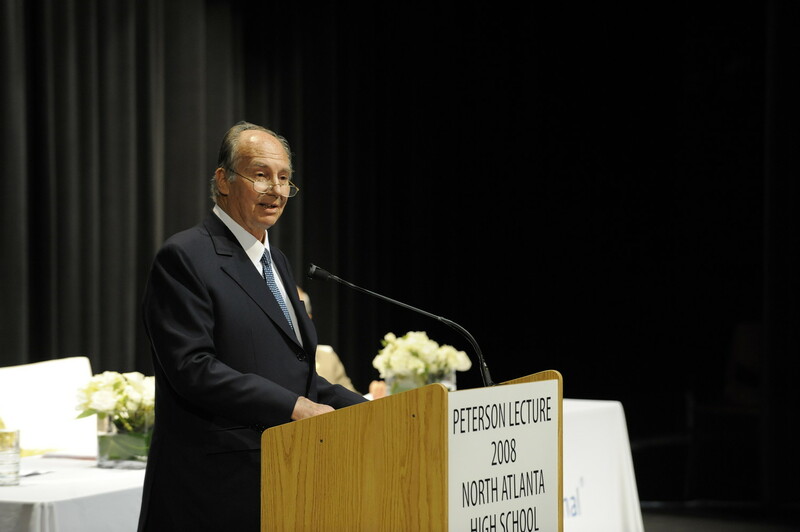 Delivering the Peterson lecture at the annual meeting of the International Baccalaureate programme in Atlanta, the Aga Khan cautioned that a pluralistic outlook is not an in-born skill and that it must be acquired through education. “Experience tells us that people are not born with the innate ability nor the wish to see the Other as an equal individual in society,” he said. “Pluralism is a value that must be taught,” he added. The Spiritual Leader of the Shia Ismaili Muslims, an ethnically and linguistically diverse community spread across five continents, emphasized the importance of cultural diversity in an increasingly globalized world that at times poses a threat to cultural identities. He also warned that the quest for identity can lead to exclusion. "The quest for identity can become an exclusionary process - so that we define ourselves less by what we are FOR and more by whom we are AGAINST." "I believe that the coexistence of these two surging impulses - what one might call a new globalism on one hand and a new tribalism on the other - will be a central challenge for educational leaders in the years ahead. And this will be particularly true in the developing world with its kaleidoscope of different identities," he added. He said that challenge will be taken up by the Aga Khan Development Network's ambitious new project to create over the next decade a network of 18 Academies that will provide quality education to exceptional students of all backgrounds in 14 developing nations. Students will be selected based on merit, irrespective of their ability to pay. The Academies will also provide an extensive professional development outreach program for teachers from other government and not-for-profit schools in the region. “The Academies have a dual mission: to provide an outstanding education to exceptional students from diverse backgrounds, and to provide world-class training for a growing corps of inspiring teachers,” said the Aga Khan. “As we work together to bridge the gulf between East and West, between North and South, between developing and developed economies, between urban and rural settings, we will be redefining what it means to be well educated,” he stated. The Aga Khan praised the International Baccalaureate’s education philosophy. “The IB program incarnates a powerful idea, the confidence that education can reshape the way in which the world thinks about itself,” he said. He emphasized that the Academies’ program, based on the curriculum of the International Baccalaureate, will include dual-language instruction in English and the local language. “English will enable graduates to participate fully on an international stage, while mother-tongue instruction will allow students to access the wisdom of their own cultures,” he said. The Aga Khan said that pluralistic education is as important in the West as it is in the developing world. He proposed that the International Baccalaureate community of educators work together with the Aga Khan Academies to build a bridge between the developing world and the developed world, between North and South, and between the Muslim world and the West. "Together, we can help reshape the very definition of a well educated global citizen. And we can begin that process by bridging the learning gap which lies at the heart of what some have called a clash of civilizations, but which I have always felt was rather a clash of ignorances," he said. “In the years ahead, should we not expect a student at an IB school in Atlanta to know as much about Jomo Kenyatta or Muhammad Ali Jinnah as a student in Mombasa or Lahore knows about Atlanta's great son, the Reverend Doctor Martin Luther King, Jr.?,” asked the Aga Khan. Earlier in the day, the Aga Khan met with Georgia’s Governor Sonny Perdue. Georgia is the fourth and the last leg of the Aga Khan’s 9-day tour of the United States that also included Texas, California and Illinois. This year marks half a century since the Aga Khan succeeded his grandfather, Sir Sultan Muhammad Shah, as the Spiritual Leader of the Shia Ismaili Muslims. He is marking the Golden Jubilee by visiting Ismaili communities throughout the world and by announcing new development initiatives. His Highness the Aga Khan is the 49th hereditary Imam (spiritual leader) of the Ismaili Muslims, comprised of ethnically and culturally diverse peoples living in over 25 countries around the world. The Aga Khan is founder and Chairman of the Aga Khan Development Network (AKDN), a group of private, non-denominational development agencies working to empower communities and individuals to improve living conditions and opportunities, especially in sub-Saharan Africa, Central and South Asia, and the Middle East. The Network’s nine development agencies focus on social, cultural and economic development for all citizens, regardless of gender, origin or religion. The AKDN’s underlying ethic is compassion for the vulnerable in society. Its annual budget for development activities is in excess of US$ 350 million.